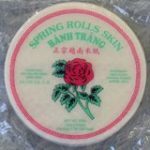 Some people call them summer rolls, rice paper rolls, spring rolls or even rainbow rolls. I love to call them summer rolls since it’s always warm where I live. 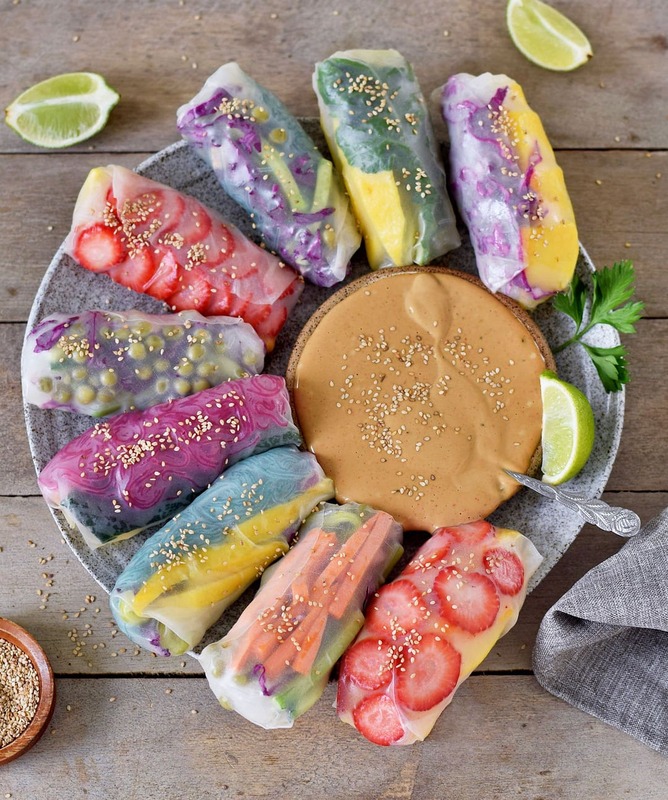 These vegan summer rolls are filled with so much goodness, they are delicious and healthy. I have made many summer rolls in the past and it seems most people love them. When I posted these vegan summer rolls on my Instagram account @elavegan people often went crazy and asked for my recipe. 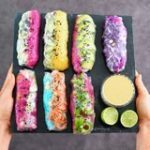 These rolls are colorful and pretty, they are healthy and a great party snack. I love how versatile summer rolls are. You can add your favorite ingredients, make them look fancy and colorful or keep them simple. I love to include a lot of vegetables, sprouts, legumes like chickpeas, a few nuts or seeds and sometimes even fruits. And yes I often get fancy and color the noodles pink, yellow or blue! I am not using any artificial colors, I color them with beet juice, turmeric and spirulina powder, which are perfect to use as all natural food coloring. Of course, you don’t have to color your noodles and just use them plain. 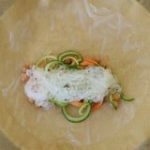 To make this recipe, you will need rice paper, your favorite veggies/fruits and either rice noodles or any other “Asian noodles”. The noodles I am using are called “cellophane noodles” (glass noodles), they are very thin, transparent and only need to cook for one minute. You can also use regular rice or stuff your vegan summer rolls with veggies and/or fruits only. I like to include glass noodles though as it keeps me full for a longer time. You can use any dipping sauce of choice. I made a hot peanut butter dipping sauce but when I am lazy I often just dip these rolls in soy sauce. The recipe for the creamy peanut butter sauce is in the recipe notes. You can make it nut-free by using sunflower seed butter! Let me know if you try out my recipe and please report back if you liked it. 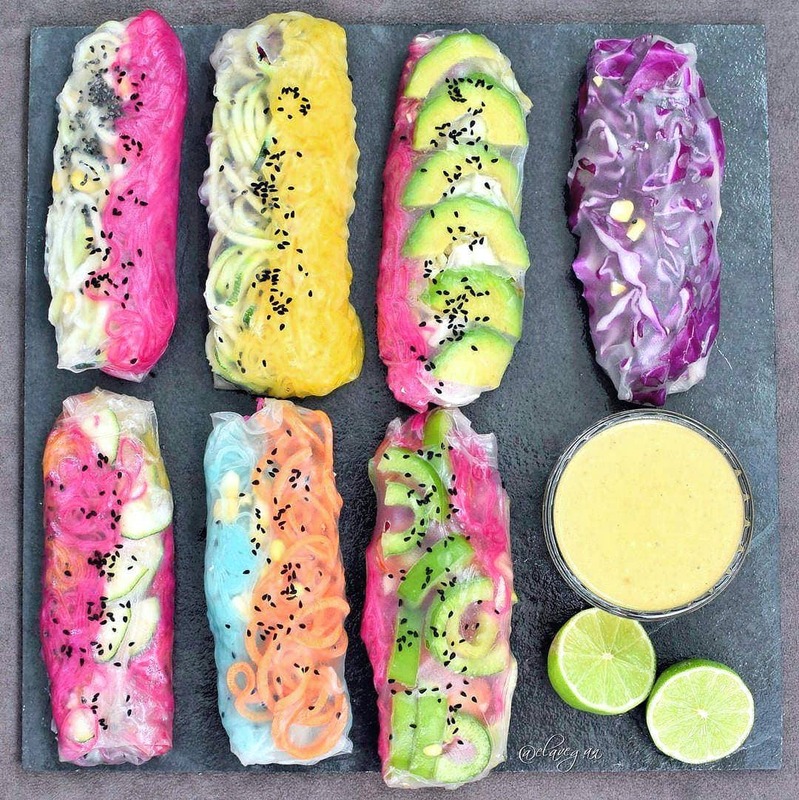 Vegan summer rolls which are often called spring rolls or rainbow rolls. 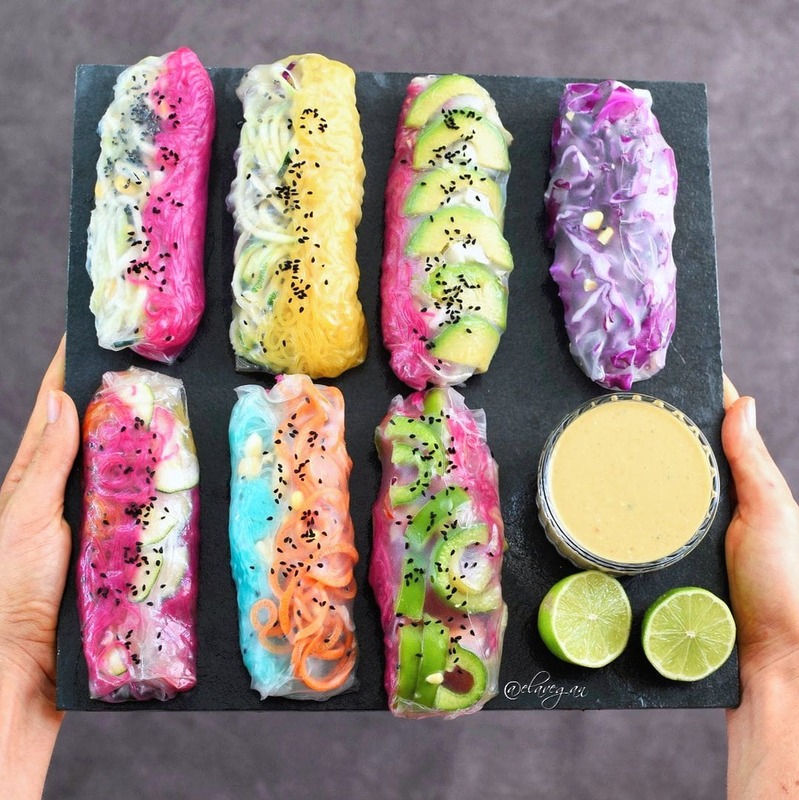 These rolls are colorful, healthy, gluten free and delicious. 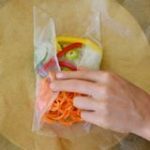 Fill them with your preferred veggies and get creative! Boil the noodles as per the instructions on the packaging, discard the hot water and rinse with cool water. Optional: Color one part of the noodles with beet juice and stir until all the noodles are pink. You can color the other part with a little bit of spirulina powder (for a nice turquoise color) or with turmeric powder (for a nice yellow color), get creative! Dip in sauce, of choice, for example, soy sauce or peanut butter sauce (recipe below in recipe notes). Enjoy! Mix everything together in a bowl with a whisk. Enjoy! Thank you so much for your kind comment, Harriet. I am so glad you like my colorful summer rolls ???? What is the bright blue and pink filling in the ones pictured? These are so pretty! 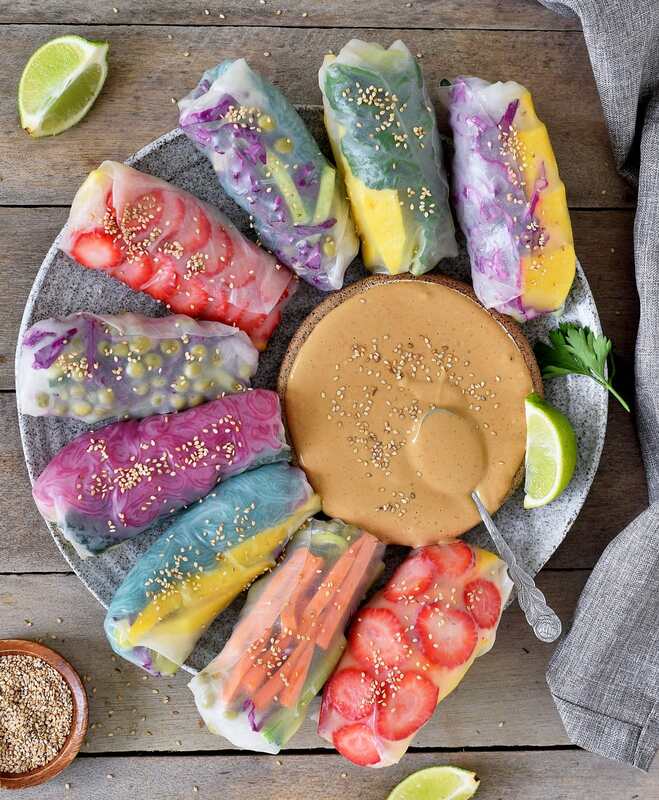 Spring rolls are eaten frequently at our home, but yours are the most colorful I’ve ever seen! 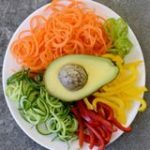 Great way to “eat the rainbow” as nutritionists recommend.I’ll have to try coloring the noodles next time. We always wrap with some fresh herbs: cilantro, Thai basil, mint, etc. Thanks for sharing! Can you share your spicy peanut dipping sauce? ???? Ho Ela, I’m going to make your summer rolls for bday dinner 🙂 is it ok to make them a day ahead? These look delicious, May want to remind people that if they use soy sauce it is not gluten free. Thanks! Do your spring rolls happen to freeze well? I’m a meal prep person who would love to eat these throughout the week! Can i get recipe for the sauce? Add some hoisin, soy sauce and garlic and it’s money. I don’t use sriracha but a different hot sauce that I make that doesn’t contain as much garlic. If you use sriracha, you probably don’t need to add garlic. This recipe got a family favorite in our house!! It takes a little time for the preparation, cutting all the fresh ingredients in stripes , but it is so easy ! While you are cutting you already think about how you put everything together to get a nice colorful result! That’s fun! I tried the root beet coloring and it worked perfectly! The noodles got this nice pink color, it just took a little while so I learnt to start with that first! Thanks so much for your inspirational posts and helpful advices!! You’re simply the best???????? Hi Eni, I know it can be hard to wrap them up. My first few tries were a disaster, haha. It also depends on the rice paper, I have had fails with many but then found a brand which I love. So definitely check out various brands from your supermarket. Sorry, I don’t understand your question regarding the chickpeas. What exactly do you mean? 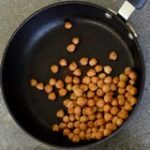 Is far as the chickpeas comment goes, I believe was referring to was what combo did you make using the chickpeas. Because you have it in the ingredients list but not in recipes or any made and showing in picture. I didn’t have wax paper handy so I put a bit of oil on a plastic cutboard. Worked well for me. Complete novice in the kitchen BTW and appreciate the well thought out recipe. I also am curious as to what the bright pink and blue ingredients are in your spring rolls. I don’t see anything in your list of ingredients that would be that color. Hey Ela, I love these wraps! Yours look so beautiful. I bought some rice paper wanting to make them myself. I like to prepare healthy meals and snacks ahead for the week and was wondering how long the prepared wraps would last in the fridge and be good to eat? Do you have to cook the zucchini and cabbage? I assume so but I didn’t see it in your instructions so I just want to make sure haha. I’ve been experimenting with these roles on and off for about a year. I aspire to having them look as lovely as yours. Love your posts. So I just bought a package of rice wrappers because they were on sale. And then looked up recipesthat are gluten free to fill and make.so of course the colors caught my eyes right away. I booked marked and will be experimenting with ingredients and such. So I see the ones with strawberries and such. Did you put anything else with them but strawberries? What other fruits did you use or can you use? I excited because I have 28 different food sensitivities and am constantly looking for new ideas, or new things I can eat. That way not eating the same thing all the time and give me variety. So I have never really eaten spring rolls /summer rolls etc to much. They are fine to eat cold , say especially fruit ones or just raw veggies? If I put meat in can warm up? As regards the strawberries, I also add rice noodles in addition. Another fruit that I love adding is mango! And yes, you can add some of your homemade chia seed jam and/or sunflower seed butter. Just try out different varieties. The good thing about summer rolls is, that you can add or leave out whatever you want. I always eat them cold, never tried to warm them. I don’t think they taste good if you warm them. ok . is it normal for them to get sticky before you even roll it . i am talking with like a minute? i have never eaten spring rolls before and i did make a couple the other day but they were already sticky before even rolling it. i did just peaches . i like the adding the noodles idea to fruit as well. i guess i will have to play with them more. I just made these summer rolls. It was a fun activity to do with kids! I used smoked pepper powder to make the noodles orange. The ones we did not eat right away, I stroke them with some oil and put them in the fridge. Thank for this great, delicious and fun recipe. Hi Ela, can I just ask; when you say beet juice do you mean the liquid in a can of pickle beets? I’m excited to try this recipe, I don’t think I’ve ever seen such beautiful food.